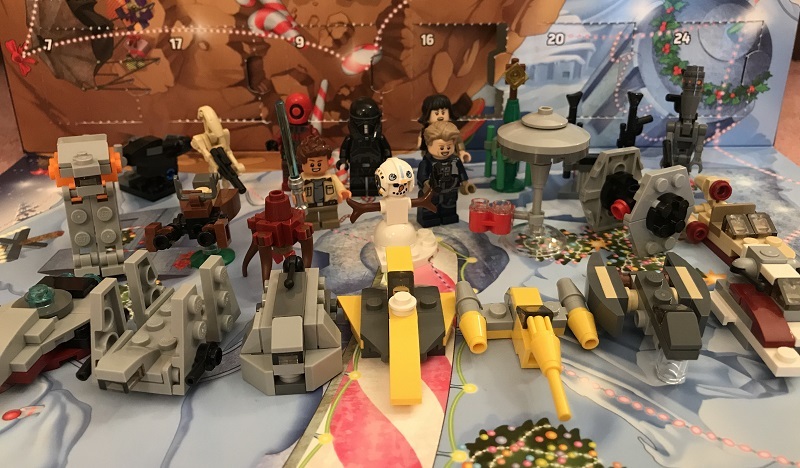 Welcome to our LEGO Star Wars Advent Calendar 2018 review. Each year, LEGO excites us with some amazing models and minifigures from the evergreen Star Wars. And that makes the holidays even more fun and something to look forward to, for children and adults alike. 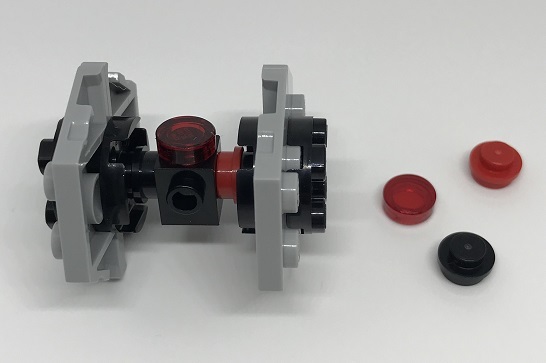 So, let’s dive in the LEGO 75213 review, and see what’s in store for us. 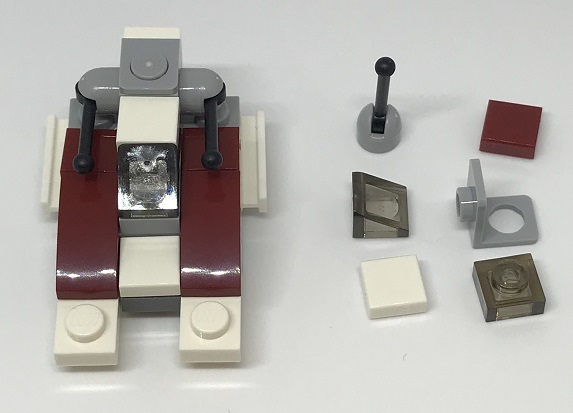 If you’re really into Star Wars, you may also want to see our updated 2019 Star Wars sets guide, or our thoughts on the 15 Best LEGO Star Wars Sets. 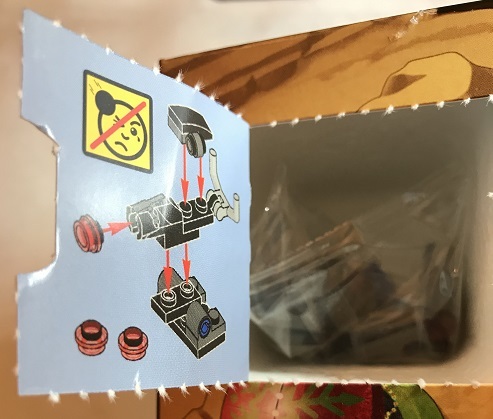 First, let’s take a look at the front of the box, which unfortunately gives away many of the surprises that LEGO has designed for us. Also, you can clearly see that some of the pieces are repeats of the past, so that is frustrating. 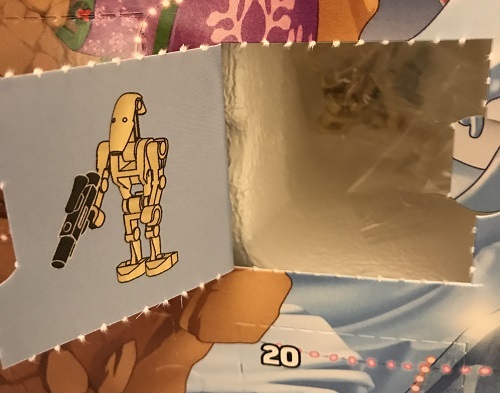 One of the biggest surprises of the 2018 Star Wars advent calendar is right on the front cover. 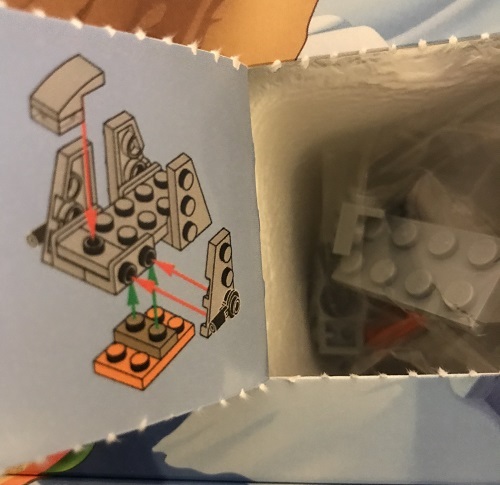 LEGO, what were you thinking? Moving on to the back of the cover, it does not give us any more insight into the contents of the box. The front of the box served that purpose to a great extent. 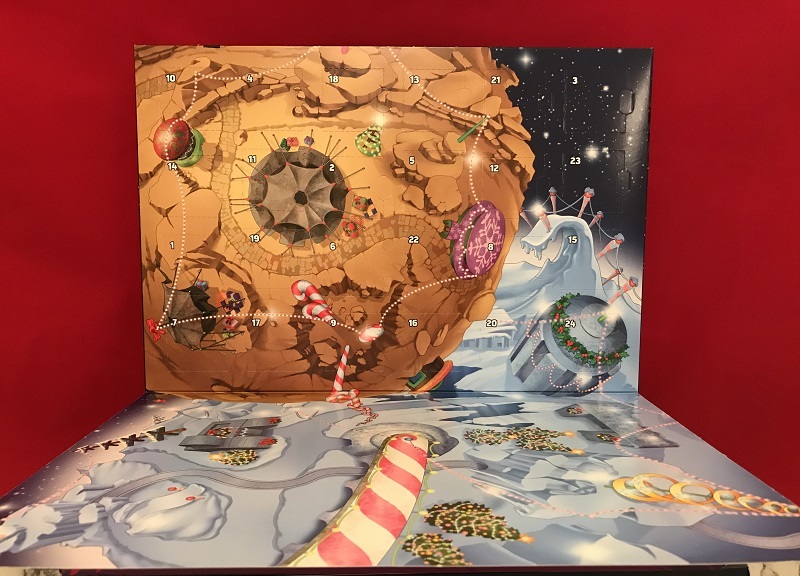 Just like always, the advent calendar comes with a fold-out play-mat that you can use for playing, as well as for displaying all your cool vehicles and minifigs. Now let’s move on to the actual review of the individual pieces. Please note that the following information contains spoilers! Day 1 of the LEGO 75213 calendar is a pretty strong start. 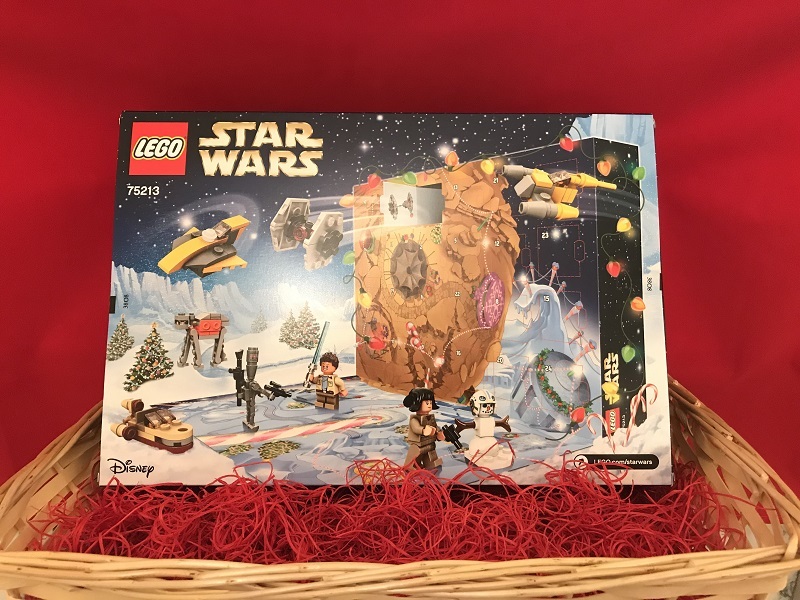 However, it is slightly disappointing because the exact same model, Luke’s Landspeeder, was a part of the LEGO Star Wars Advent Calendar in 2014. So, no surprise there. With three engines, and a cockpit for two, this pretty little vehicle is a great copy of the actual anti-gravity craft shown in Star Wars: A New Hope. The base of the landspeeder is designed in such a way as to give the illusion of a hovering craft, which I think is wonderful. The set consists of 20 pieces, of which two are spare. 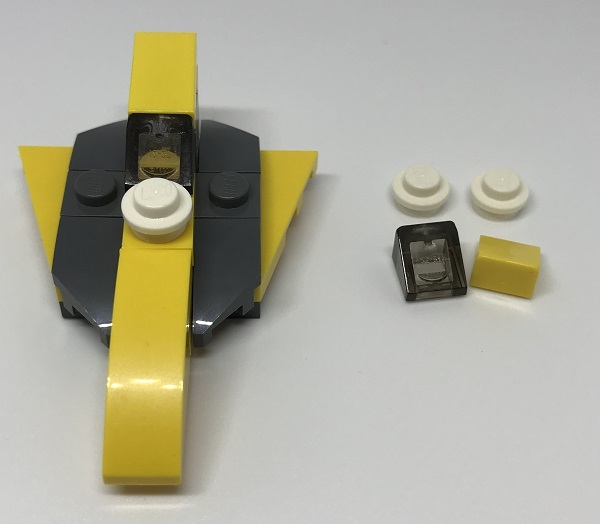 LEGO first released this landspeeder in 1999, and over time it has had a number of changes and improvements. Luke Skywalker’s amazing craft was first seen in 1977 in the movie Star Wars, which was later renamed as Star Wars: Episode IV – A New Hope. In the movie, Luke sells his landspeeder to pay Han Solo to take him and a few friends to Alderaan. Landspeeders can also be seen in Star Wars: Episode 1 – The Phantom Menace when Naboo security forces make an attempt to take back Theed. These crafts also appear in Episode II and Episode III of Star Wars. Back then, who could even imagine building a miniature landspeeder out of LEGO? 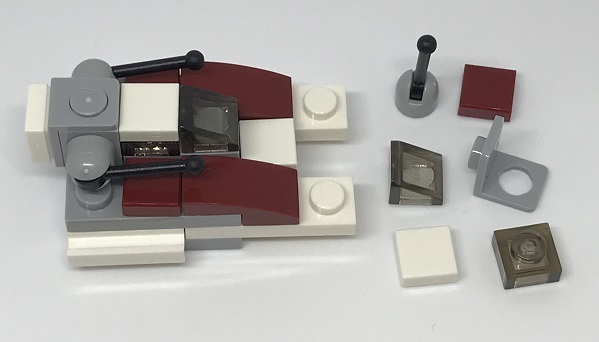 Luke’s Landspeeder is also available as a separate LEGO set, 75173. This 149-piece set was released in 2017 and is rated highly among fans. 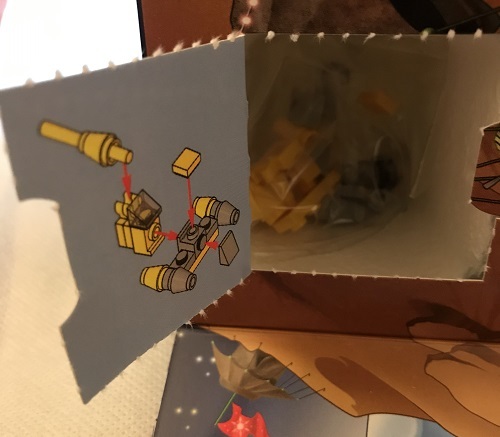 Overall, I think that there should have been another model instead of the landspeeder to start the LEGO Star Wars Advent Calendar 2018. It’s a fairly good start, but something a little more unique would have been better, especially for those that buy the calendar every year. 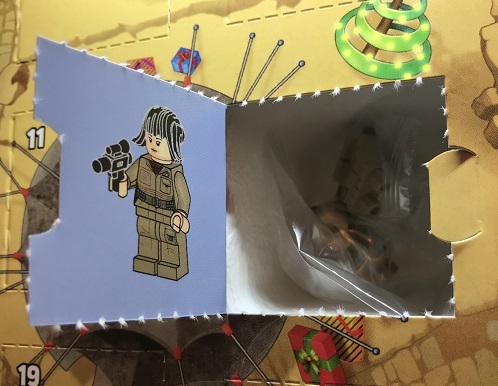 Moving on to Day 2 of the 2018 Star Wars Advent Calendar, we get Rose Tico. 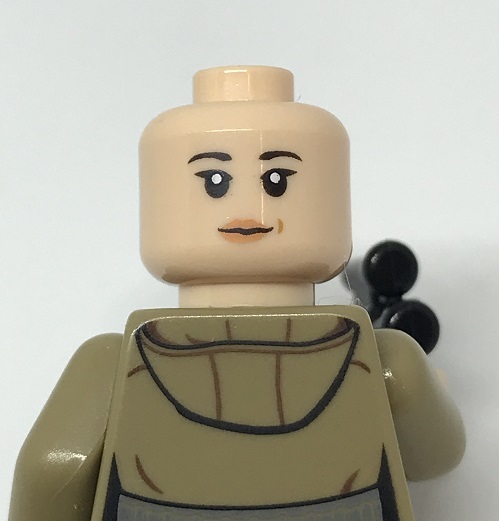 Rose’s hairdo from the movie The Last Jedi has been impeccably copied on this minifigure, and any Star Wars fan is instantly going to recognize her. The figure is packed with detailed prints; Rose has a grey belt on her waist that goes all the way around her back, and she also has a hood on her back that I believe is an excellent detail. On her left thigh is a pocket with her gadgets. Just like the previous models, this one has two different face prints on each side: a neutral one and an angry one. The piece comes with the standard black gun that goes perfectly with the angry face print. Rose is an incredible maintenance technician who joins the Resistance after her home is destroyed by the First Order. She is on the front lines of the galactic civil war, and the death of her sister only serves to strengthen her resolve. Rose Tico first appeared in the movie Star Wars: Episode VIII The Last Jedi in 2017. 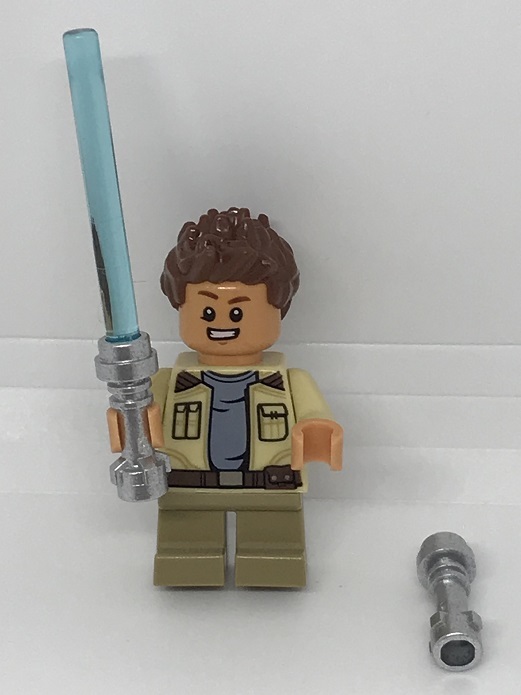 LEGO soon turned the character into a minifigure, in a Star Wars: Episode VIII inspired set first released in September 2017. The Resistance Transport Pod 75176 is a 294-piece set that features Rose dressed as a Resistance member. In the LEGO 75213 calendar, Rose is dressed the same. 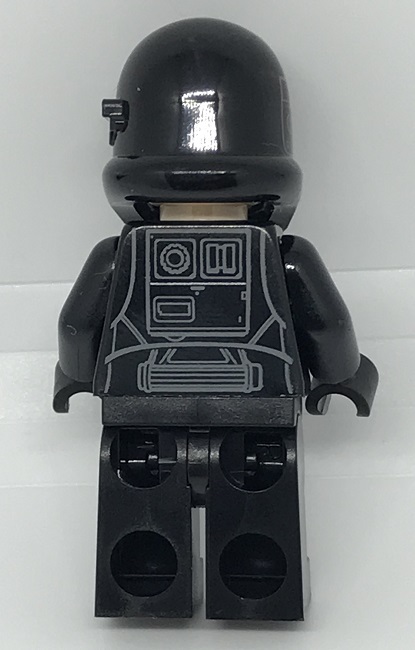 Rose was also disguised as a First Order member in January 2018 for the First Order AT-ST 370-pieced set, 75201. 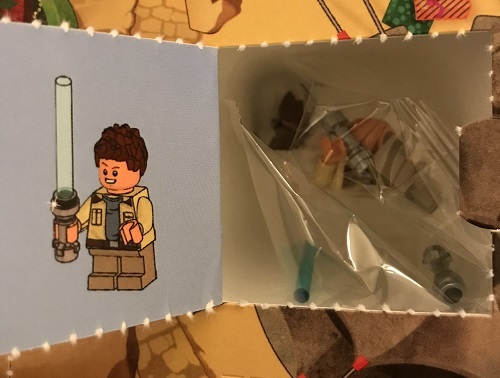 I actually feel LEGO did a good job placing the Resistance member variant in the calendar as it’s what most resembles her and resonates with fans. 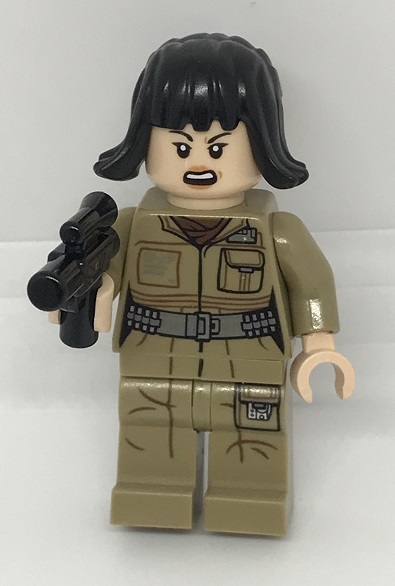 Although Rose Tico is not a popular character among Star Wars fans, it still is a part of the movie and deserves a place among your prized minifigure collection. 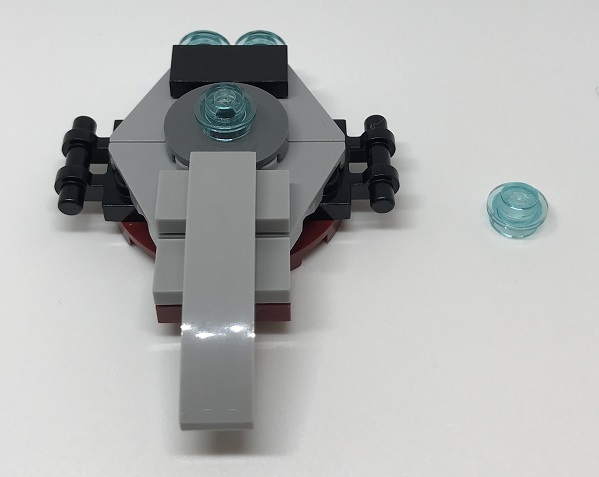 If you have played with LEGO Star Wars 75186 set, then you will have no problem recognizing Day 3’s gift as the Arrowhead. For others, it might be a little confusing at first. The Arrowhead is based on LEGO Star Wars: The Freemaker Adventures, which is an animated TV series. It was released back in 2016, and so far has had just two seasons. This television show follows the story of a family that builds and sells ships. In season 2 of the show, the family gathers all the pieces required for building the arrowhead. 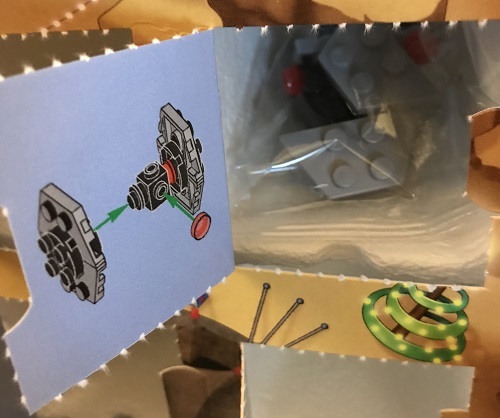 Luckily for you, all the pieces required to assemble the Arrowhead are right in the day 3 compartment of your LEGO Star Wars Advent Calendar 2018. So, go ahead and add this funky model to your collection. This starfighter was the focus point of season two of The Freemaker Adventures. It is shaped like a diamond with a kyber crystal placed in its core that gives the ship its beautiful blue glow. 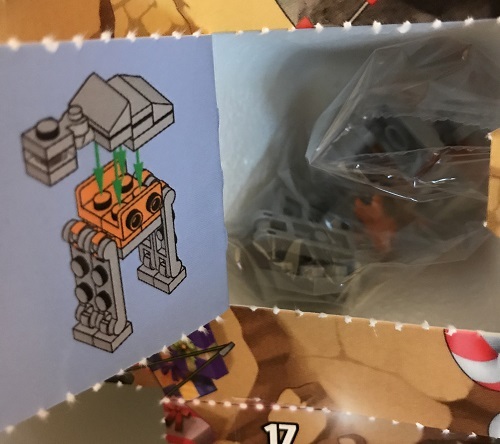 LEGO 75186 is a 775 piece set that was released in 2017, and I am excited to find a miniature of it in the 2018 LEGO Star Wars Advent Calendar. 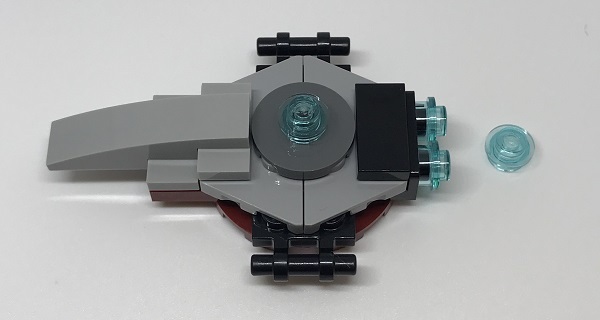 Many people consider this piece an inadequate depiction of the actual craft in the show, but I feel that it is a pretty awesome microbuild, considering the tiny components. The arrowhead is made up of 15 pieces, and comes with one extra blue crystal. After all, your ship must keep glowing! You will be happy to find a miniature of the Republic Fighter Tank on day 4 of the calendar. It is a wonderful microbuild that is an excellent addition to your collection. Now the original tank in the movie has two laser cannons, and two antennas on either side. 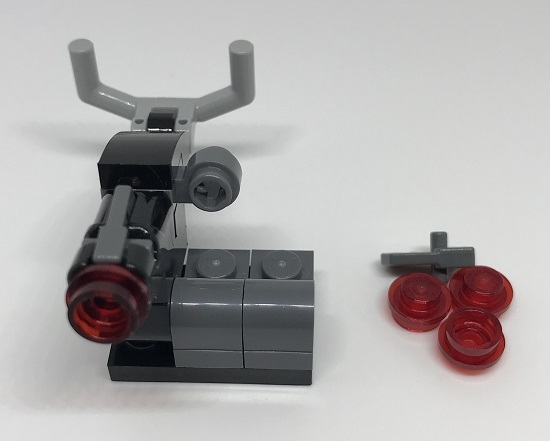 The antenna pieces used on the sides of this microbuild represent the laser cannons, with the in-universe antennae being absent. This vehicle has been released twice by LEGO as a complete set. The Republic Fighter Tank 7679 was introduced in August of 2008, as a 592-pieced set. 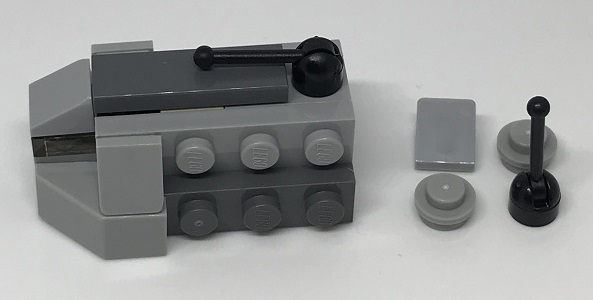 Almost a decade later, LEGO released an edited version of the same tank in 2017. The Republic Fighter Tank 75182 is made up of 305 pieces, which is much less compared to its predecessor. This vehicle is also known as the TX-130, and in the movie, it is used by the Grand Army of the Republic as well as the Jedi Order. It is a very fast and maneuverable tank that the jedis use in the clone wars. It is also sometimes referred to as the IFT-T. The tank is made up of 21 pieces, and it comes with 6 spare pieces, including an antenna (or weapon) and a cockpit. I appreciate the spare components because it means that you can have your model for a very long time. Welcome your second minifigure on day 5 of the LEGO 75213 advent calendar. It is tall, and thin but very intimidating. With its powerful weapons, sophisticated sensors, and a rotating body, the IG-88 is impossible to hide from. 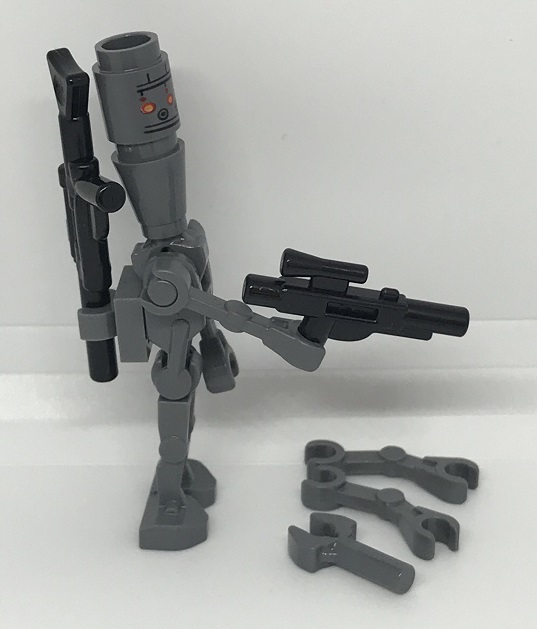 The rogue droid holds a weapon which I believe is the IG-88 rifle in one hand, and there is another weapon on his back which I am sure is the stormtrooper blaster. I really like the orange spots on his head that imitate the droid’s sensors from the movie. Such minute details are truly fabulous. The IG-88 first appeared in The Empire Strikes Back in 1980. He is a droid that goes rogue due to its incomplete programming. Soon he earns the reputation of a merciless bounty hunter because he is totally obsessed with hunting and killing. With multiple sensors, and an array of weapons, he is one of the best bounty hunters ever. This assassin droid also appears in the book Star Wars: The Original Trilogy – A Graphic Novel, and the games Star Wars: Force Arena, Star Wars: Galactic Defense and LEGO Star Wars: The Complete Saga. 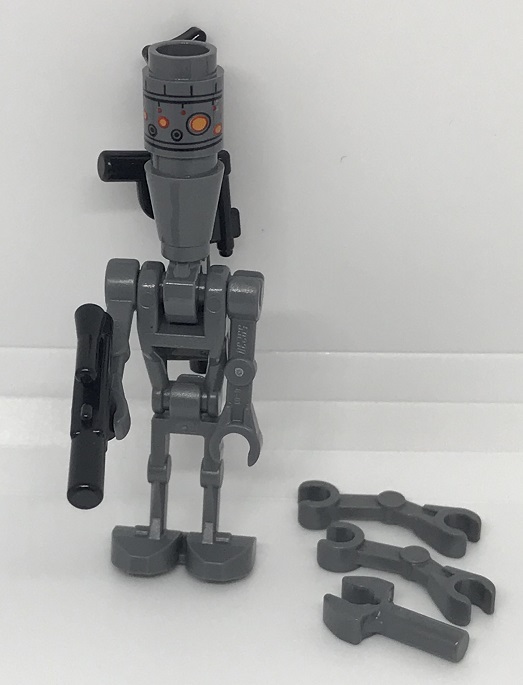 A different version of IG-88 was also previously released as part of Super Star Destroyer 10221, a 3152-pieced LEGO set, back in 2011. 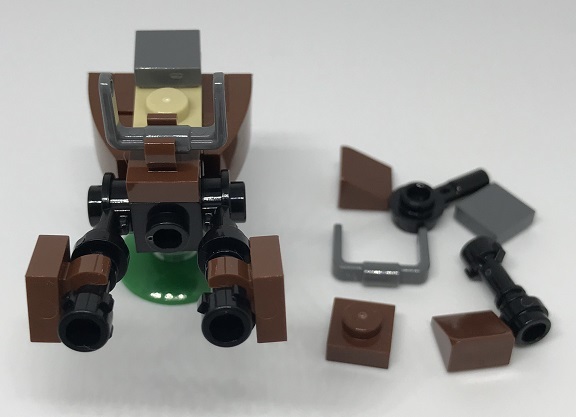 This figure previously appeared in 75167 Bounty Hunter Speeder Bike Battle Pack. The model comes with three extra components, which really prove useful if you ever lose a part. 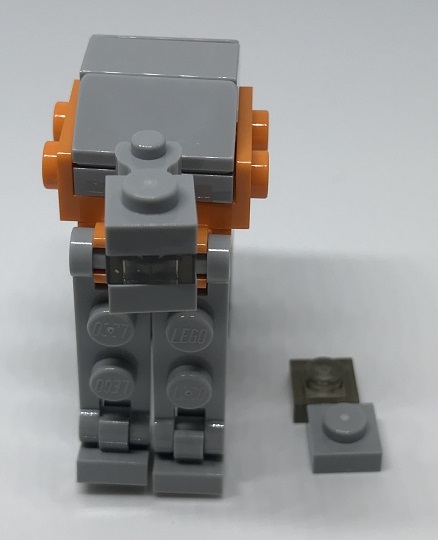 Although this droid is a part of various LEGO sets from the past, it still is a rare minifigure that I absolutely adore, and I’m sure most fans will consider it a marvelous addition to their Star Wars horde. 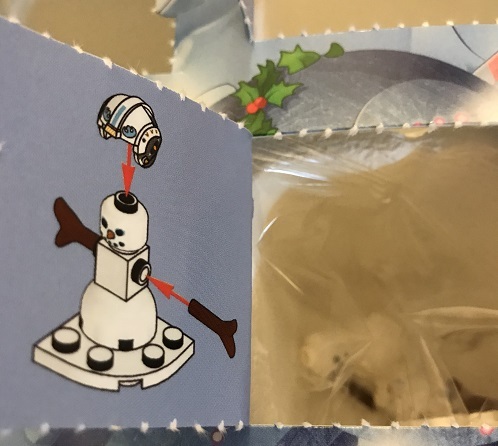 I am very pleased to see a microbuild of the cloud city on day 6 of the advent calendar this year. It is a sweet piece that I bet all of you are seriously going to enjoy. The amount of detail in the cloud city is just wonderful. 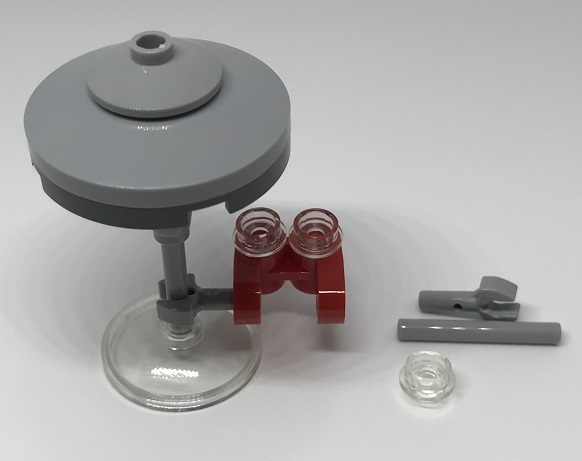 What I really love about cloud city is that it is instantly recognizable, and this is the first time ever that LEGO has released a miniature of it. 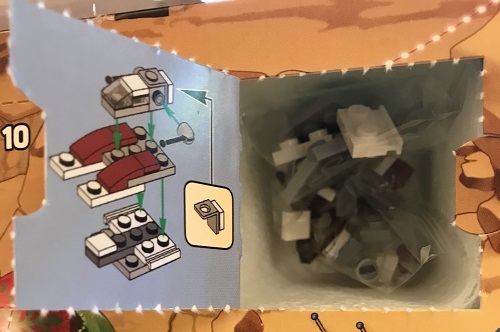 I would say that the 2018 LEGO Star Wars Advent Calendar just got interesting! Bespin is home to Cloud City which is totally man-made, and floats in the clouds of the planet. The city is occupied by millions of individuals who work there, live there, or are just visiting to see the sights. A popular tourist activity in cloud city includes riding a cloud car. You will be happy to see a miniature cloud car attached to this microbuild; I sure was. An interesting feature of this cloud car is that it can be moved around the structure and up and down as well, which makes it even more awesome. Cloud City first appeared in The Empire Strikes Back in 1980. Its microbuild is a rare find. 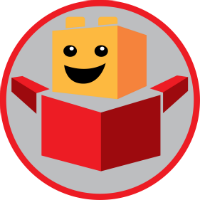 It was also released as a complete LEGO set in October 2018. 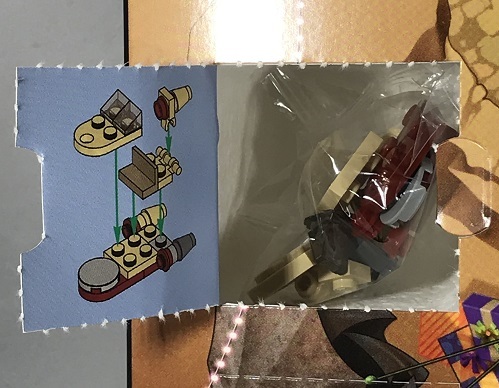 The set is called Betrayal on Cloud City 75222, and is composed of 2812 pieces. The instructions for building this model were not as clear as I would have liked. It did take me sometime to figure it out. On the other hand, I also feel that this confusion makes for an interesting build as you spend some time making sense of it. This model also comes with a few spare components which is great. However, there is one thing that I do not like about this model. As compared to the other pieces so far, this one disassembles very easily. It is not as strong as the other models are. And that’s all for day 6. Moving on to day 7, we have the Naboo Starfighter, or also known as N-1. It’s an excellent model but unfortunately, not a great surprise, as it has been released in the past as well. In the advent calendar of 2012, 9509, the exact same build can be found on day 7. Past issues aside, the microbuild is totally amazing. It matches the actual space craft in the movie as closely as possible. The color scheme is perfectly copied, with a grey front and a bright yellow back. 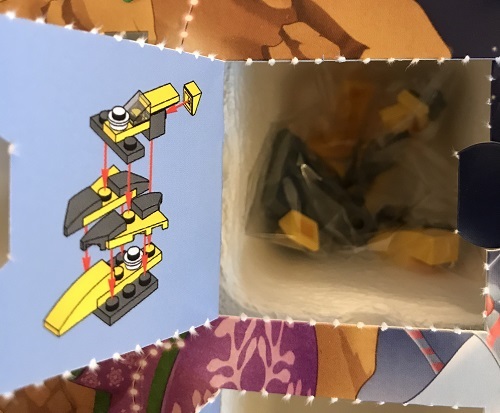 The back of the craft is also nicely extended just like in the movie, and I totally love this detail. It has a single seat cockpit, with a spare cockpit in case you ever lose one. The model comes with two more spare pieces for the front of the craft. 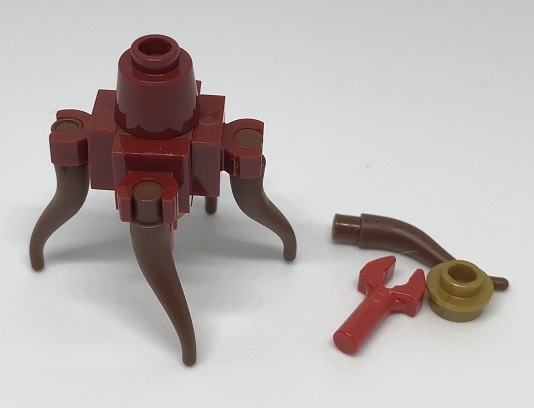 There is, however, one feature that I think would have made this microbuild even more interesting. 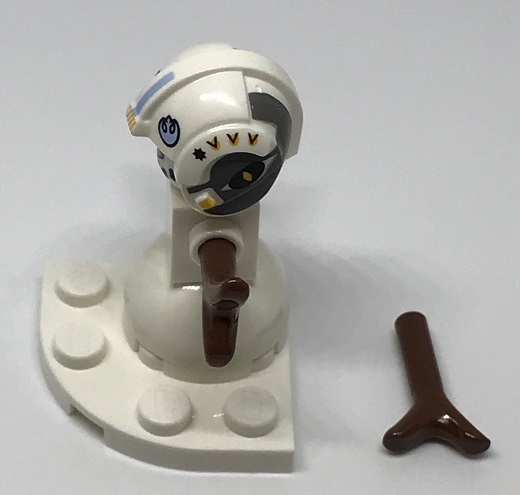 In the original space craft, there is an astromech droid behind the cockpit. 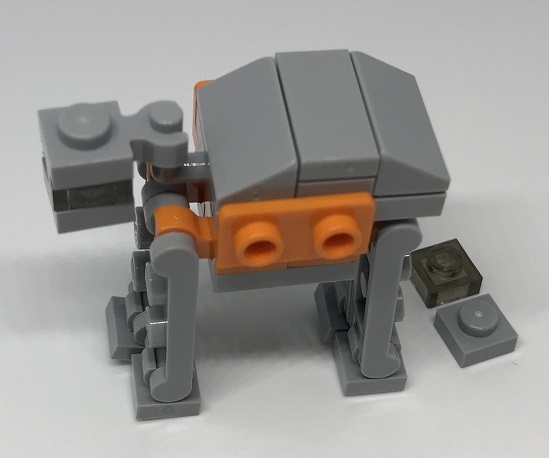 If there was the same round droid-like piece in this LEGO model, it would have been much better. It would also have been a great variation considering the fact that the exact same starfighter was released in 2012 as well. As the name suggests, this royal craft was built by the Naboo. With its shiny surface glinting in the sunlight, it was totally in line with their royalty. The N-1 Starfighter first appeared in Star Wars: Episode 1 The Phantom Menace. It also appeared in Return of the Jedi, and several other episodes. Naboo N-1 Starfighter and Vulture Droid 7660, a 279-pieced model, was released as a LEGO Star Wars set back in 2007. The bright yellow color is perfect, and I think that it adds life to a Star Wars collection. If this is your first time with a Star Wars Advent Calendar, then you are lucky because it is a beautiful microbuild. And if you have this craft from a previous calendar, well, now you have two. And that’s not all bad. The craft is also pretty easy to build. 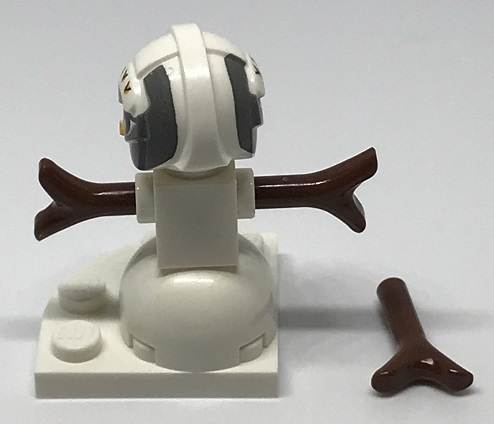 Meet a battle droid on day 8 of the LEGO 75213 advent calendar. 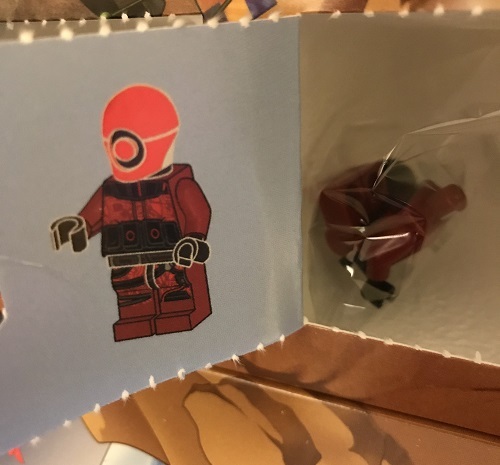 I’m sure many of you must be disappointed, like myself, to see this minifigure. There isn’t much to it. It just has a blaster in one hand, and comes with two spare arms. 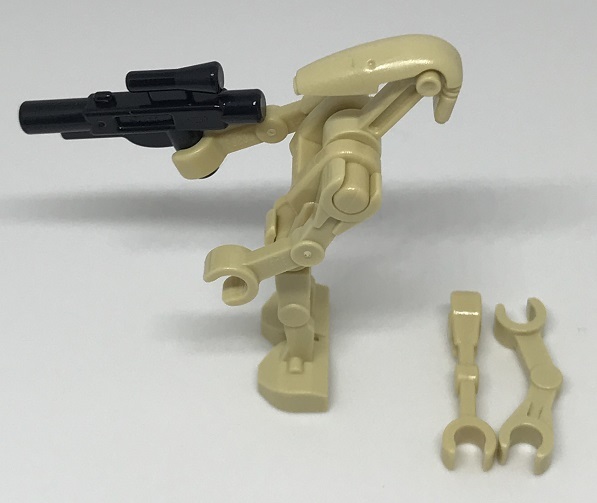 Battle droids are extremely easy to get in LEGO so I don’t consider this minifigure as exciting as the other pieces. However, I do appreciate their resemblance to the actual droids used in the movie, so that’s a plus. One feature that could have made the battle droids a tiny bit fun is color. 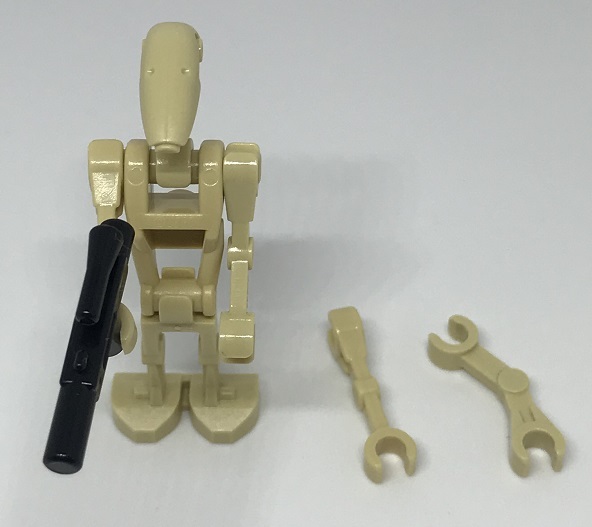 If LEGO used the different colors, such as yellow and pink on the upper body of the droids like in the movies, these minifigures would be somewhat nice to collect. In the movie, these mechanical soldiers are used in massive numbers in the Clone Wars, by the Separatists. As you can see from the appearance, these droids are not intimidating or scary at all. They are just used to overpower the Republic civilians, and that is what they are best at. The model is simple to build, so no confusion there. And that’s about it for this figure. Day 9 of LEGO 75213 is General Grievous Ship, the proper name for which is the Soulless One. The model is as interesting as its name. 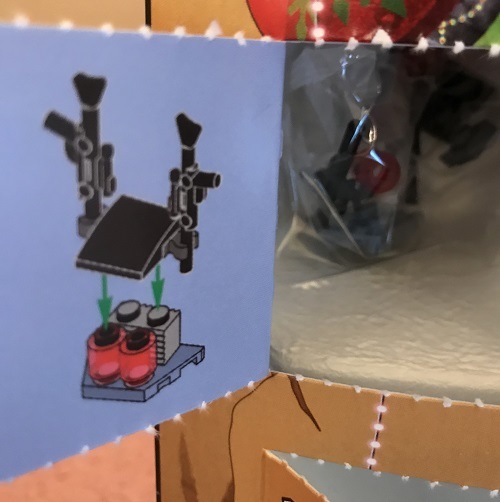 We haven’t had this microbuild in an advent calendar before so that makes it a lot of fun. It’s one of the stronger builds in the calendar this year so I really like it. Star Wars: Clone Wars is an animated television series in which General Griveous’ starfighter first appears. General Grievous is a Separatist leader who owns the Soulless One. The wings on this model can be moved around up to 90 degrees which I find an interesting feature. Other than that, the build is very easy to figure out. The only thing that I don’t really appreciate about this microbuild is the color scheme. I understand that it’s just a grey ship in the series, but I do feel that the shade could have been improved a bit on this model to make it look nicer. This space craft was released as General Grievous’ Starfighter 8095, a 425-pieced LEGO set back in 2010. Finding a miniature version of it in the advent calendar this year is truly a delight, and I am pretty sure that you all will agree with me. On day 10 of the advent calendar, you will find the turret. 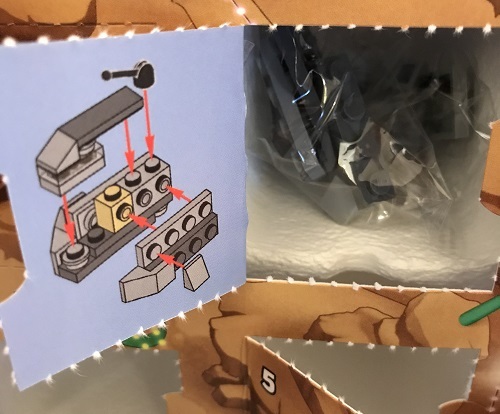 It is not surprising though because LEGO has released this before in the advent calendars, including 75146 and 75097. However, each time the design of the turret is different so I guess that is something to look forward to. Although it took me a little longer to figure out how to put it together – as the instructions were not perfectly clear – I was happy with the final result. It is a very clever piece and if you press down on the grey part, it shoots out the red stud. This adds extra playability to the calendar which is great! 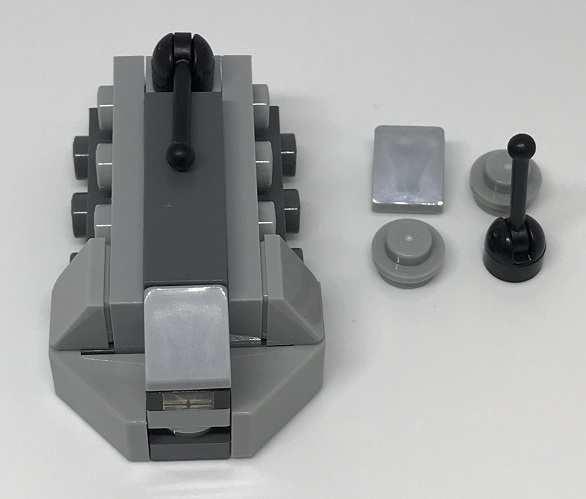 And just so you can keep playing with it, LEGO has included a few extra studs, in addition to some other spare components. Turrets are used as a mount for weapons in Star Wars movies. They are designed such as to be able to rotate and shoot in all directions. They can be mounted on a variety of vehicles, including starships and starfighters. All in all, it’s a fun model with movable parts, and I enjoyed building it. 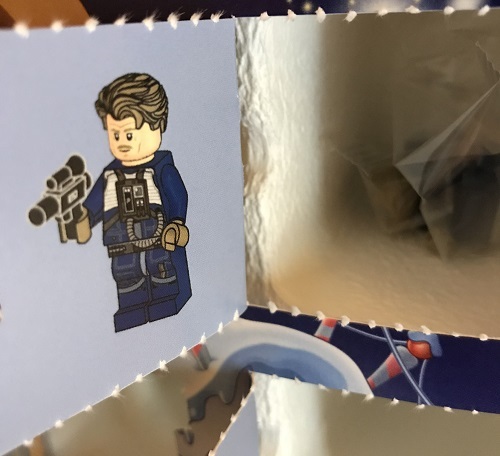 Rowan is your next minifigure on day 11 of the 2018 LEGO Star Wars advent calendar. 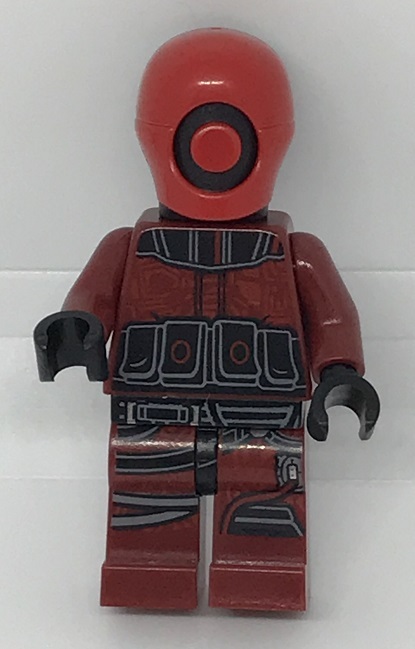 It’s a funky model, and unlike Rose’s minifigure, this one has just one happy, or should I say naughty, face print on one side. What I really like about this model is the light saber, especially its blue color. LEGO is excellent at copying the hairdo, and just like Rose’s hair, Rowan’s hair is also exactly like that in LEGO Star Wars: The Freemaker Adventures. Rowan is The Freemaker’s Adventures’ main character, and first appeared in 2016. 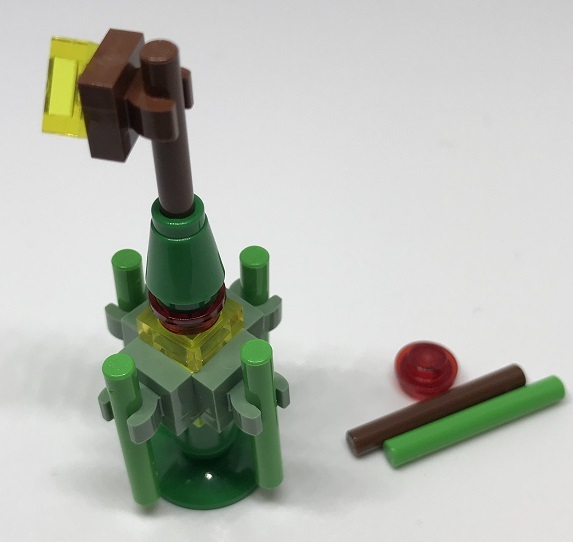 I think that this minifigure would have been better if the color scheme was a bit brighter, like the one used in LEGO Starscavenger 75147, with a yellow top and green bottoms. 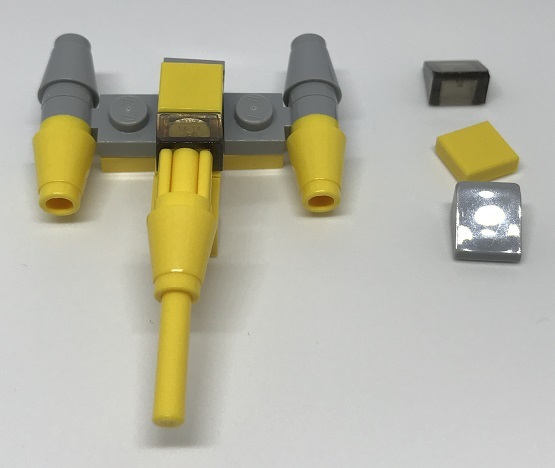 A model of Rowan Freemaker can be found in LEGO Tracker 75185 as well, which resembles the one in the calendar of 2018. 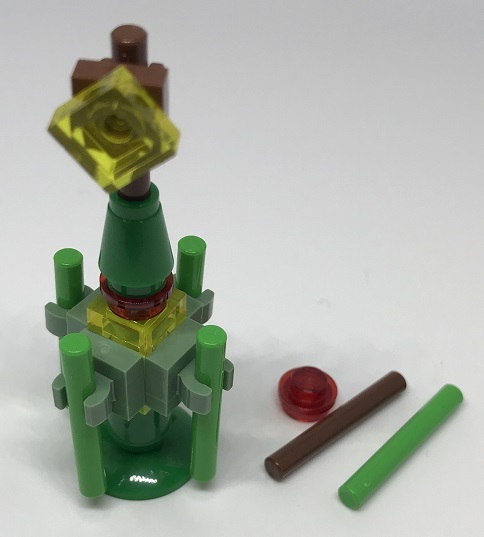 In a nutshell, I think that this piece is not a very special one because it’s been previously released as a part of complete sets. If there was some variation, then I would say that it’s a fabulous model, but there’s none, so let’s move on. 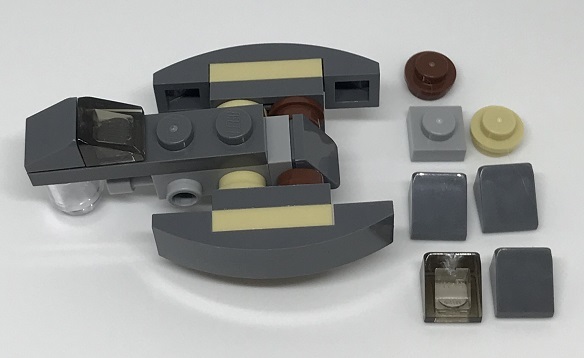 Day 12 opens up a window to Anakin’s Jedi Starfighter, which is one of the stronger microbuilds. It is quite a decent model with sloping pieces on the side which I like very much. It really enhances the entire look of the starfighter. Anakin Skywalker is an excellent Jedi soldier who actively participates in the Clone Wars, flying his Eta-2 Actis-Class Jedi Interceptor, which appeared in Episode III. This vehicle is the similar to Delta-7B, which is an earlier version of Anakin’s starfighter that appeared in the Clone Wars TV series. The Eta-2 is comparatively smaller in size and has a very different shape, but is more powerful. 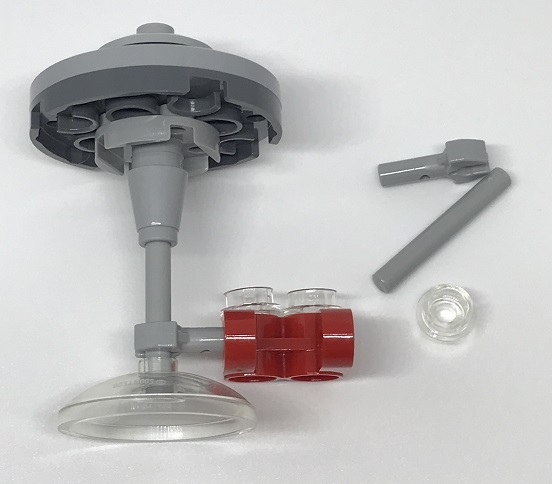 As you all can see from the microbuild, it is an awesome looking starfighter, with even a 1×1 round plate used to represent R2-D2 when he is docked inside the ship. Moreover, Anakin’s Jedi Starfighter is ranked 3rd among the top 10 best starfighters on the official Star Wars website (www.starwars.com). LEGO has released this vehicle twice before as a complete set. 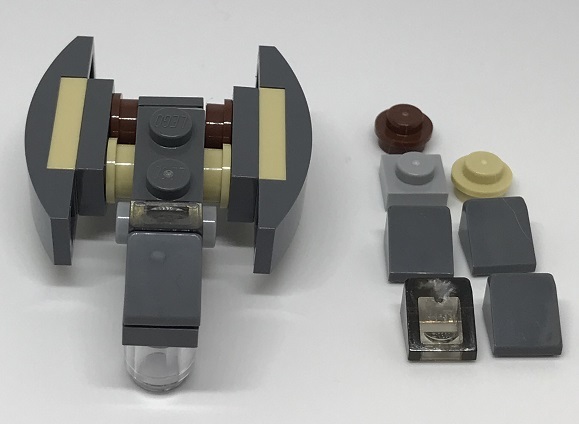 In December 2007, LEGO introduced 7669 Anakin’s Jedi Starfighter, a 153-pieced set that was the first-ever LEGO set based on the Clone Wars TV series. And just this year, LEGO released another version 75214 Anakin’s Jedi Starfighter, which is a little bigger, composed of 247 pieces. 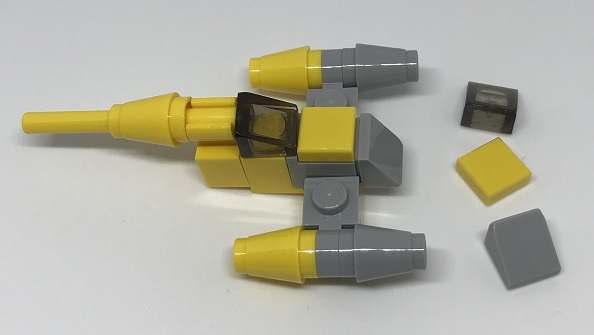 Building this starfighter is a delight, and because there is no confusion in the instructions, it’s very easy as well. Overall, it’s a model that I love having in my collection. 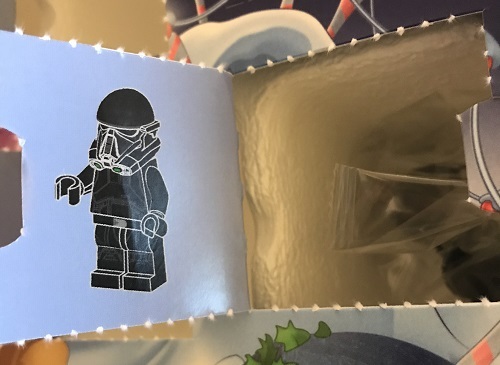 Open the door to a grey imperial troop transport on day 13 of the LEGO Star Wars Advent Calendar 2018. Generally speaking, LEGO has done a good job of shrinking the vehicle. But otherwise, making it a part of the advent calendar does not make sense because I don’t find it exciting at all. However, everyone has a different perception, and because this piece has never been in an advent calendar before, some of you might really enjoy it. The imperial troop transport (ITT) appears in the Star Wars movies to move troops, and was used to move troops or prisoners on occupied worlds like Lothal in Star Wars Rebels. Although the vehicle is not intended for battle, it still is intimidating with all its laser guns. The ITT was made into a complete set by LEGO as Imperial Troop Transport 75078 in 2013. 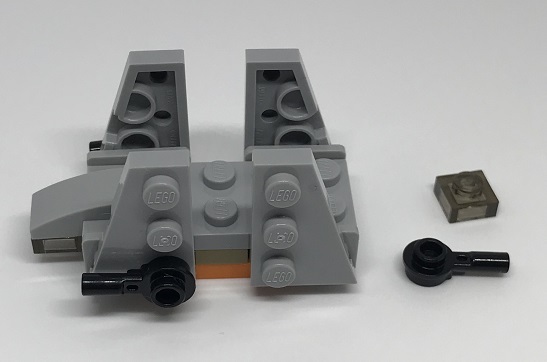 The structure of 75078 is a little different from the microbuild we have been surprised with this year. The model comes with a few spare pieces so that’s a good thing, although it’s not likely that I am going to need them. 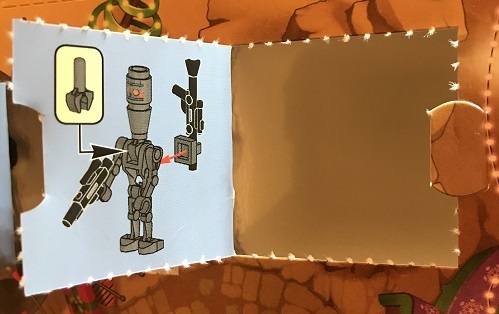 On day 14 of the LEGO 75213 calendar, you get a blaster holder, because you need it so. I’m just joking, nobody needs it, or wants it. All that I hear people liking about this piece is its sand blue base. Sadly, I do not see what is so special about the color, or this piece as a whole. Two weeks into the advent calendar, and this is what you get. 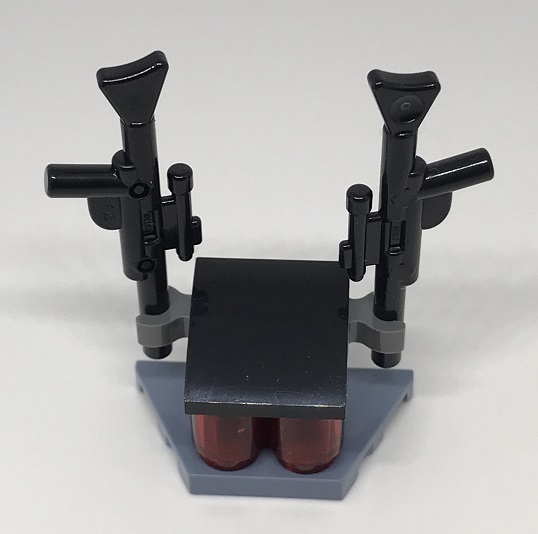 This blaster holder could have been replaced with something much more appealing and interesting, such as a minifigure, or a vehicle. Star Wars has many characters and vehicles that LEGO could have chosen from. Rose Tico and IG-88 both have similar weapons, so they are pretty easy to come by. And that, I feel, is the reason I don’t find this holder special. That’s all for day 14. When it comes to minifigures, I would say that the advent calendar this year is quite strong as compared to that of last year. On day 15, you have the imperial death trooper. The details on this figure are not very special, it’s just a standard death trooper, but still a nice addition. If you take off the helmet on this one, you’ll find an angry face print. 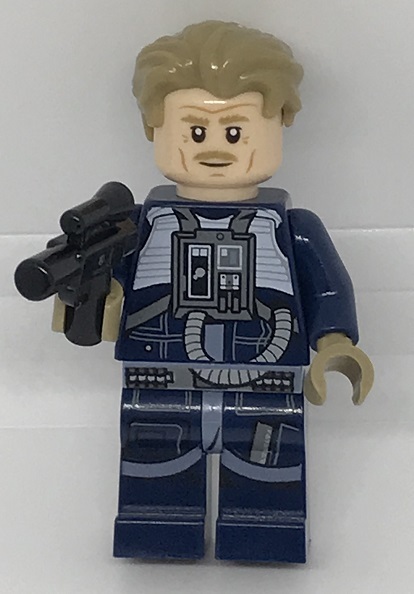 In comparison with the other minifigures in 75213, this one is by far my favorite. It has a really cool helmet with interesting details. Assembling the model is a piece of cake. I would have appreciated if the helmet would lock tightly on to the trooper’s head; it comes off very easily and there’s no spare helmet. Other than that, I really like it. The death trooper, however, has no weapon whatsoever which does not make much sense. 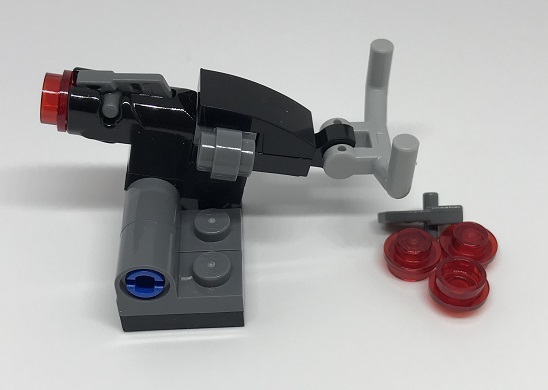 Guess I could put the guns in the blaster holder to a good use by handing them to this awesome minifig. 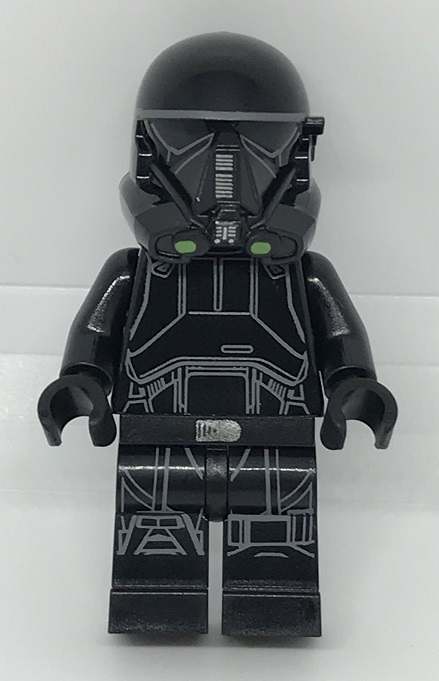 The imperial death trooper was released as a 106-pieced full-sized figure 75121 by LEGO in 2016. 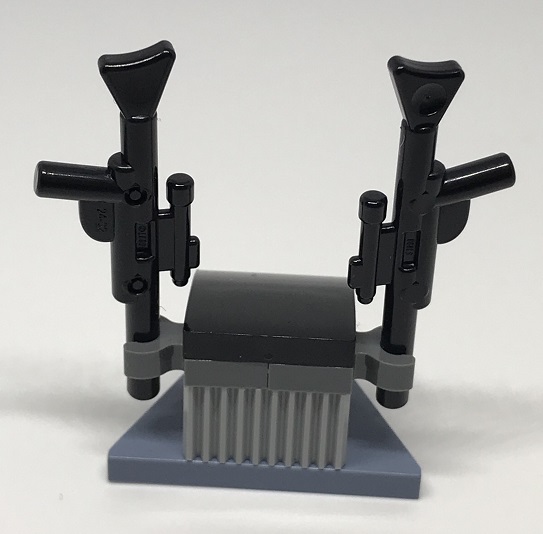 The same year, LEGO also released Krennic’s Imperial Shuttle 75156, an 863-pieced set, which contained two death trooper minifigs. On day 16, you get a rathtar which you will recognize only if you are a die hard Star Wars fan. Otherwise, you might be confused about what this is. The structure is nicely copied from the movie so I really appreciate that. The golden component would have looked better if it was a shiny golden color instead of the dull gold it actually is. It would have added a tiny bit of bling to this piece. A rathtar is a dangerous predator that appears in the movie Star Wars Episode VII: The Force Awakens. The model is very simple to build, and comes with a few spare pieces. I like that the components lock on very firmly with one another. 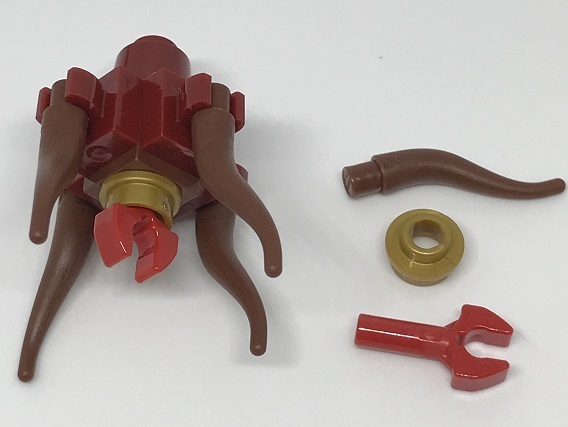 Rathtar figures were formerly released as a part of LEGO Rathtar Escape 75180, but those are considerably different than the miniature model this year. All in all, it is a new and interesting piece as it has not been in any advent calendar before. Day 17 is quite a delight, thanks to the Guavian security guard. It has got a cool head mould which I like a lot. 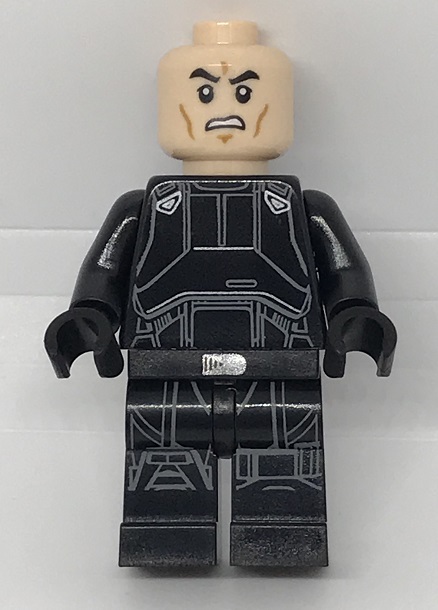 These characters first appeared in Star Wars Episode VII: The Force Awakens in 2015 where they met their untimely end due to the rathtars, and this minifigure was first released in 2017. 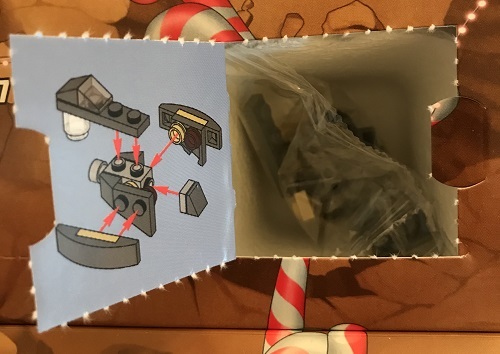 I think that the advent calendar is a cheap way to get these minifigs because they are otherwise only included in an expensive LEGO set so far. 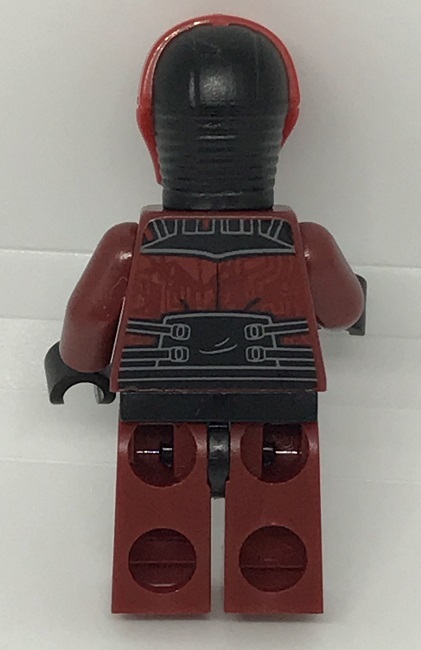 There are two of these in LEGO Rathtar Escape 75180 which is for USD 80. So, like I said, if you just invest in an advent calendar, you get a pretty good deal. The model has details printed on most parts, and I like the red color; adds a punch to my collection. Day 17 was a good day. Day 18 opens up a window to First Order TIE Fighter, which I think is fantastic. It is instantly recognizable, and has a nice shape. 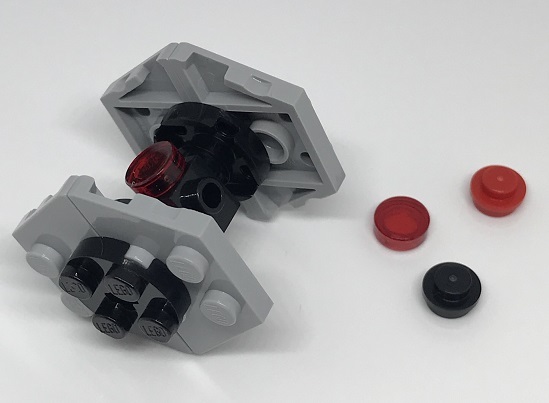 LEGO has released TIE fighters before as well, but this one has a different shape, which makes it unique. For the First Order, TIE fighters were a symbol of pride and power. These starfighters first appeared in the Star Wars movies in 1977. LEGO released First Order Special Forces TIE Fighter 75101 set in 2015. 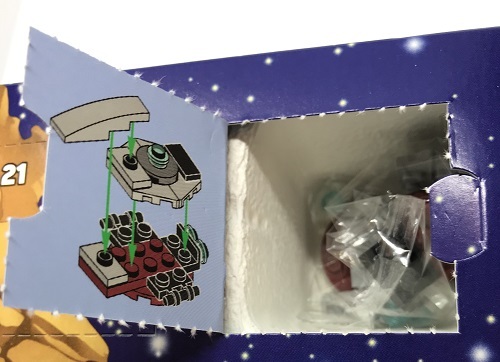 And this year we get a cool microbuild of it in the Star Wars Advent Calendar 75213. You get this amazing AT-ACT walker on day 19 of the calendar. It has a recognizable shape and I think that the orange-colored pieces look great. The AT-ACT Walker first appeared in Rogue One: A Star Wars Story. It is an all terrain armored cargo transport that is intended for moving heavy material and equipment. There are different models of walkers in the Star Wars movies that LEGO has turned into full-sized sets, but not the AT-ACT. 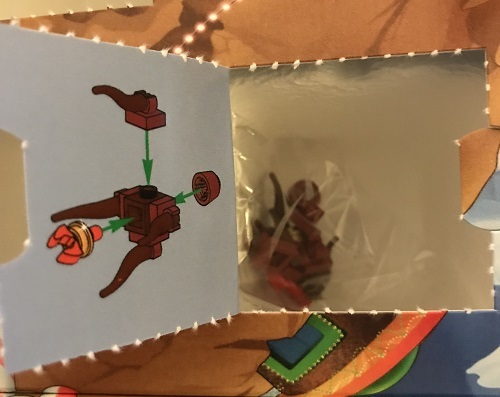 So, this is really something new in the advent calendar. It is pieces like these that fans get the calendar for, so good job LEGO! The legs on this model are movable so you can have it stand on three legs with one leg in the air, as if ready for some action. I really like it, and I think that it is a fabulous piece. It feels like the advent calendar this year grows more interesting towards the end, as opposed to its rather disappointing start. 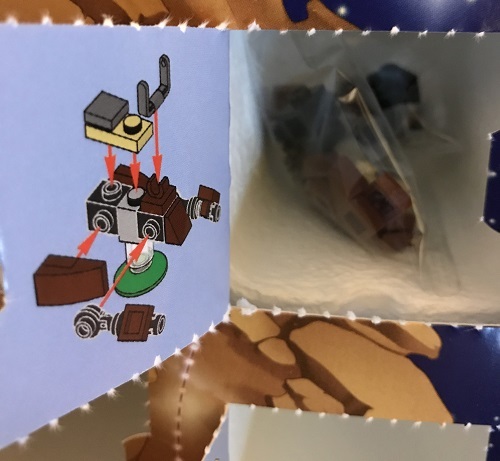 So, on day 20, you get the zeta class cargo shuttle, which has never been released by LEGO as a complete set. It’s a nice looking vehicle with weapons sticking out on both sides. And it has an orange underside, which not only adds a punch to this shuttle but is also accurate to the in-universe vehicle. This vehicle is also from Rogue One. As you all probably know, LEGO follows this pattern of having a few models from the same movie in a row. All in all, it’s not something grand like the other vehicles in the calendar, but it’s a new piece in my collection so I’m happy about that. I am really happy to see this cute speeder bike on day 21. 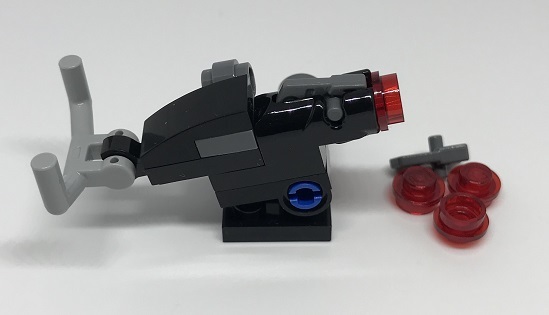 Although LEGO has done a microbuild of the speeder bike before, the design this year is totally different so hats off on that one. 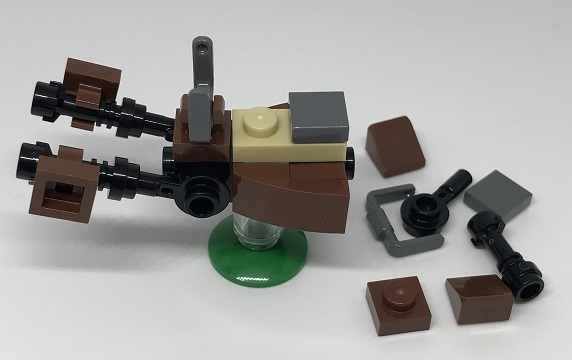 I had a lot of fun building this speeder bike with some very interesting pieces. 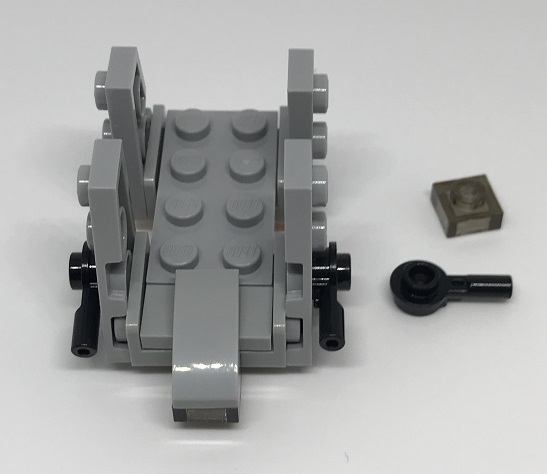 The bike stands on a green dish and cylinder for support, and comes with quite a few spare pieces so you always have a cool little bike in your collection. Speeder bikes have appeared in various Star Wars movies, including Attack of the Clones, Revenge of the Sith, and The Clone Wars, though this one in particular is based on the Imperial speeder bikes used on Endor in Return of the Jedi. These are super speedy bikes that ride through the entire galaxy. I really like the pieces on this model. Considering that it is a microbuild, you have to appreciate the amount of detail it carries. LEGO seriously put its heart into designing this one. The advent calendar just got Christmassy on day 22 with the Christmas tree-like moisture vaporator. This device is mostly used on desert planets in the Star Wars movies to obtain moisture from the air. LEGO has done versions of this before as well, but this one is really in line with the holiday season so that makes it quite a fun piece. They have used different shades of green on this miniature and that makes it very colorful. It’s a nice substitute for a Christmas tree, and I really like it. 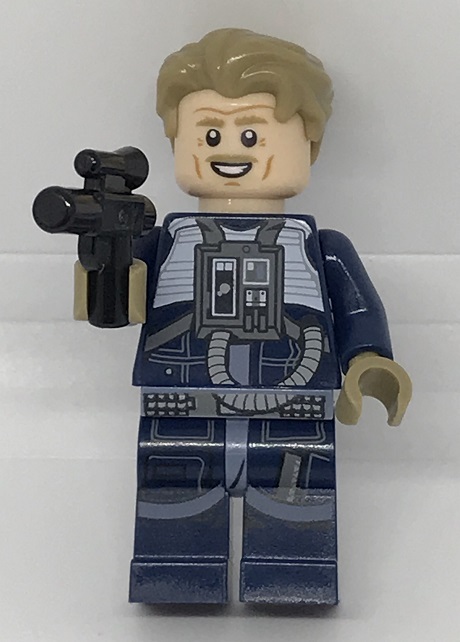 Day 23 is again from Rogue One, and an exclusive minifigure that has not been done by LEGO before. Antoc Merrick with this shade of hair piece is an awesome figure that I am very excited to get this year. It’s like a Christmas gift from LEGO. 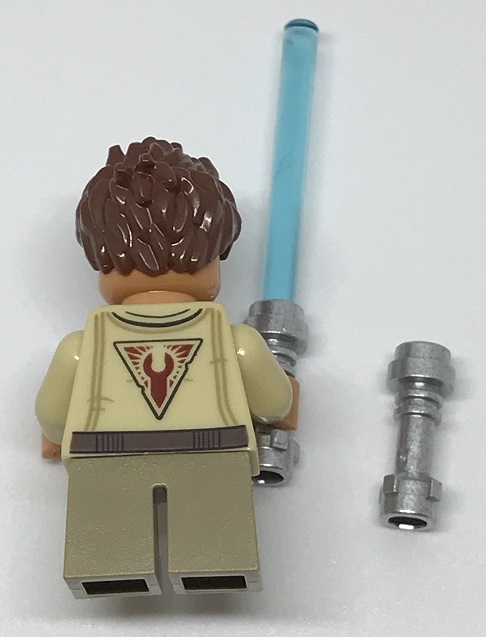 The print on his torso is similar to that of U-wing pilots, so nothing unique there. But otherwise it’s fantastic. 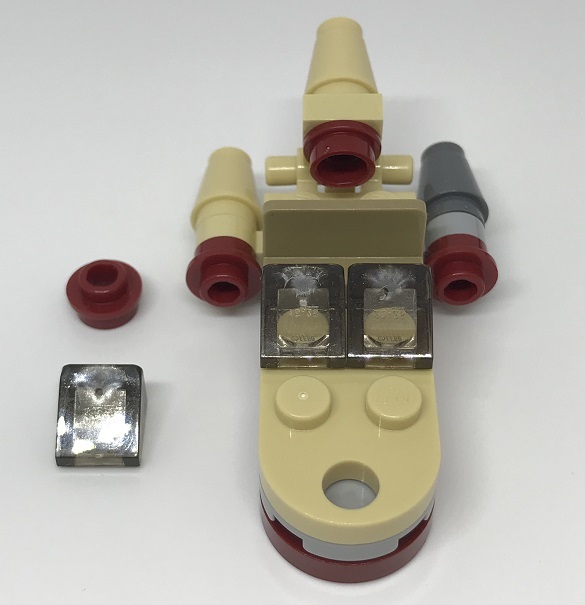 This is the very first time that we’re getting Antoc Merrick’s model, so congratulations to all LEGO and Antoc fans. The piece has two different face prints, and I personally really like the happy one. The only thing missing on Antoc is his helmet. 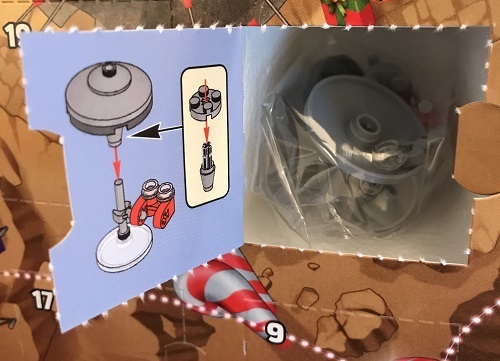 In a nutshell, I’d say that the 2018 LEGO Star Wars advent calendar started off weak, but its getting pretty fun near the end. So day 24 gives you two surprises. You get an exclusive snowman, and you get Antoc Merrick’s helmet on it. LEGO knows how to play! 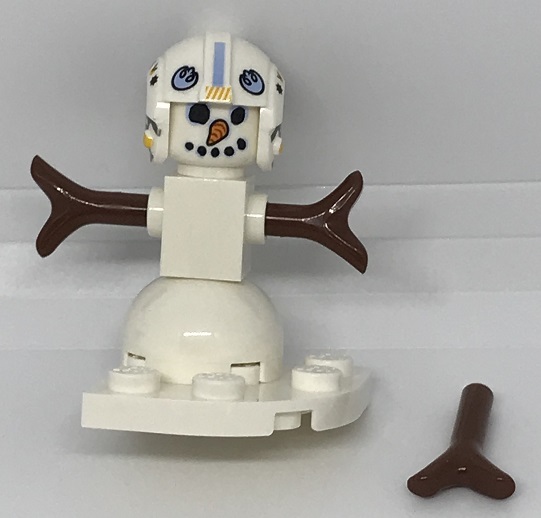 The face print on this snowman is something that we haven’t gotten before in a LEGO set. 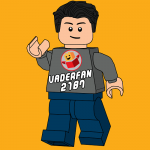 It is a totally new figure that I am very happy to end the LEGO 75213 calendar with. Moreover, you can just take the snowman’s helmet and put it on Antoc to complete his look. The snowman comes with an extra arm, and a white base to stand on. I really like the base of the snowman as it can be used for the other figures as well. Day 24 wraps up the calendar really nicely, totally matching the Christmas season. I hope you enjoy it just as much as I did. When I started with the advent calendar, it was kind of frustrating because of the repeats. But I must say that it got a lot of fun towards the end, with new and funky pieces coming out of each window. I also appreciate the spare pieces that come with almost every model. I enjoyed building them, and guessing what they were. One thing about the mini-builds in the set is that they are not minifigure-scale. I don’t know if it’s a good thing or a bad. Some people might find such tiny models pretty cute, while others might feel the opposite; it really is just a matter of personal preference, I believe. The windows had a strong build, and opening some of them was a bit tricky. 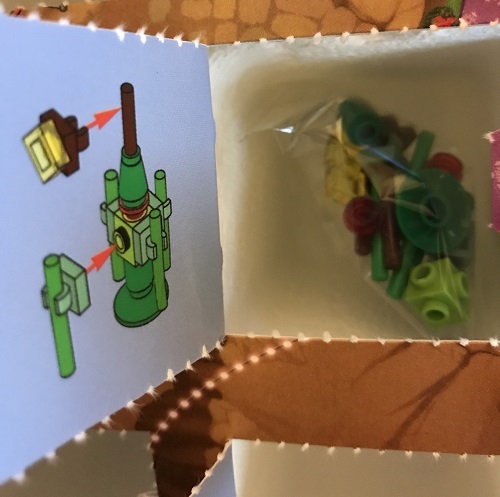 There is just one window with which I ended up tearing part of the box, but I think that’s not a big issue, unless you’re more of a perfectionist. Most of the instructions for assembling the pieces are simple and easily understandable, except for a few. But I feel that that makes for a challenging game. Personally, I have a lot of fun dealing with such challenges. The advent calendar this year lacked the Christmas element, which is quite a disappointment. Because this is a holiday gift, there should have been something much more Christmassy than a snowman and a Christmas tree moisture vaporator. 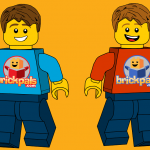 The minifigures could have had better prints that were more in line with the season, or something else like that. I did enjoy the minifigs this year but I would say that LEGO should have made figures of more mainline characters that children and adults can easily recognize. To conclude, I would say that the 2018 LEGO Star Wars Advent Calendar is awesome, in terms of minifigures. However, in terms of vehicles, you have to agree that LEGO 75213 is quite weak, especially if you religiously get the calendar every year. The other models are somewhat enjoyable, with Cloud City being my personal favorite. Time to tally the ratings! 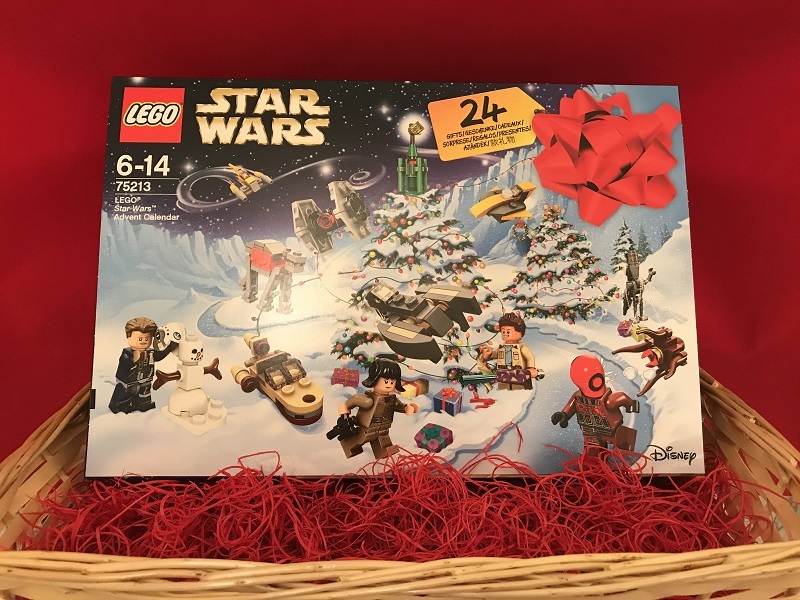 Welcome to our LEGO Star Wars Advent Calendar 2018 review. Each year, LEGO excites us with some amazing models and minifigures from the evergreen Star Wars. You built nr 10 wrong;) but thanx. We, our family, have really enjoyed reading your revealing insights and obvious enjoyment of this project. You are fan-tastic (excuse the bad pun, but you are truly a wonderful fan).